I got to Chris and Amber’s place in Minneapolis at 6:15 on Friday morning. Amber is Victoria’s friend from college, and Chris is her fiancé. I took a nap until 11:15 and then got up to write the post for Thursday. I’m glad I left Kansas City on Thursday night and not Friday morning. Yes, I was exhausted when I was done driving, but I felt better about getting to Minneapolis at 6:00 am on game day rather than 2:00 pm. 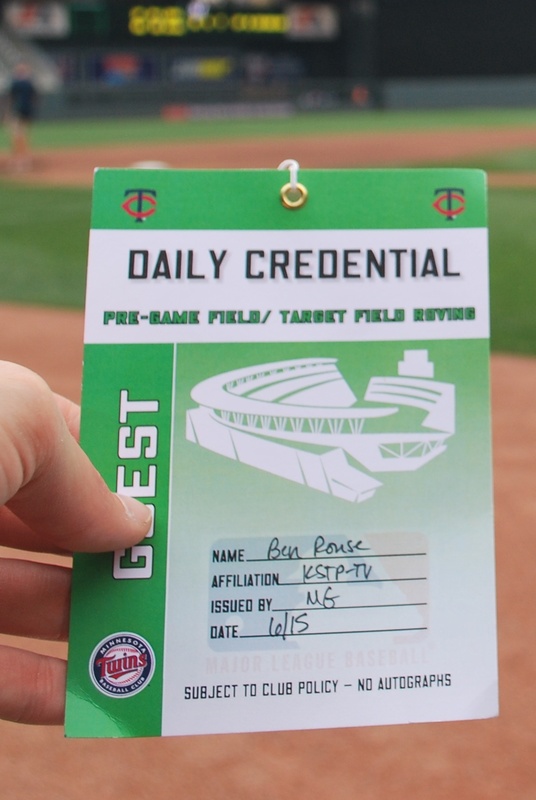 I left for Target Field at 2:20 because I had an interview with KSTP TV (Minneapolis’ ABC affiliate) at 3:00. I picked up my credentials from gate 29 and then took an elevator down to the press level of the stadium. A reporter and cameraman had come out onto the field and walked right past me. I figured they were there for me, but you can never be too sure. They were on the warning track near the Twins dugout and then the reporter makes a call. My phone starts ringing, and I answered (very unprofessionally) “I thought that was you guys.” I told her to look to her left and then waved. They came over and we did the short interview from inside the Brewers dugout. The cameraman got some B footage of me watching the Twins take BP. I don’t know how it’s going to look because by that time they were just working on bunting. It wasn’t too exciting and I probably just look like a statue since I didn’t have to move my head at all to see the ball. They left right after the interview but I hung around for a bit, and Craig Coshun and Jerry Augustine appeared in the Brewers dugout. Rickie Weeks came out and Coshun interviewed him, and then Tim Dillard. I talked with Augie for a few minutes and then asked if he wouldn’t mind taking game photo number 64 for me. I know that I’ve always gotten the first picture of a new stadium from the exterior, but I’m not going to be on the field any of the other days, so I figured what the heck. Thanks Augie! I had gotten a call and a voicemail from Tom Miller of the Janesville Gazette during my interview with KSTP. He wanted to do an interview for an article that would run in Sunday’s paper. I called him back and did the interview from a seat in section 111. I was done with the interview at 4:25 and I left the stadium to meet up with a few Be The Match employees. Nicole has been my main contact with Be The Match, and she asked if I had wanted to join her and two co-workers for Happy Hour at a local pub. I walked the two blocks to Kieran’s Irish Pub, and found them on the patio outside. It’s an enormous patio and it can probably fit 150 people out there. I had two beers and we talked about my mission, Be The Match, and cats. One of her co-workers, Kristin, is a transformed cat lover. We exchanged stories and pictures while Nicole and Jenna laughed to themselves. If they had a cat like Prince they would brag as well. Before we left the pub I had a nearby gentlemen take a picture of the four of us. Left to right you have Kristin, myself, Nicole, and Jenna. Kristin works in marketing for Be The Match and Nicole and Jenna both work for the Be The Match Foundation. Nicole had tried to get tickets but then gave up, so we parted ways as we left Kieran’s. 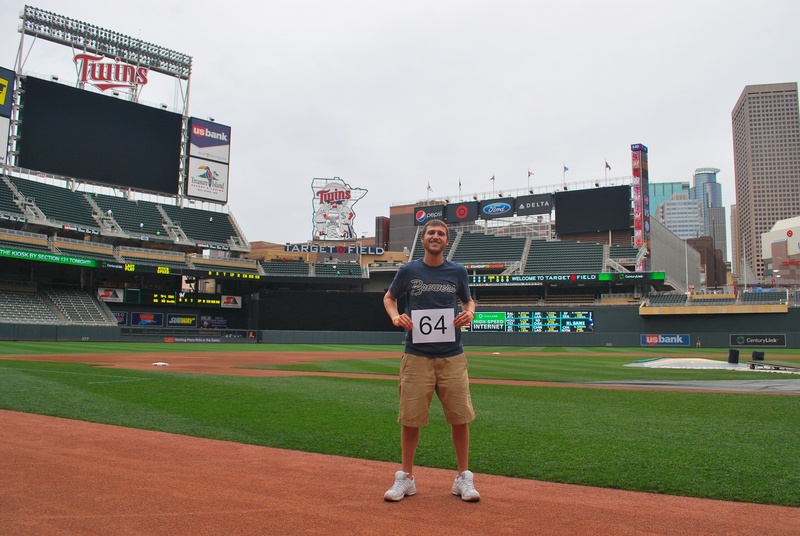 I walked to Target Field and was inside by 6:35. 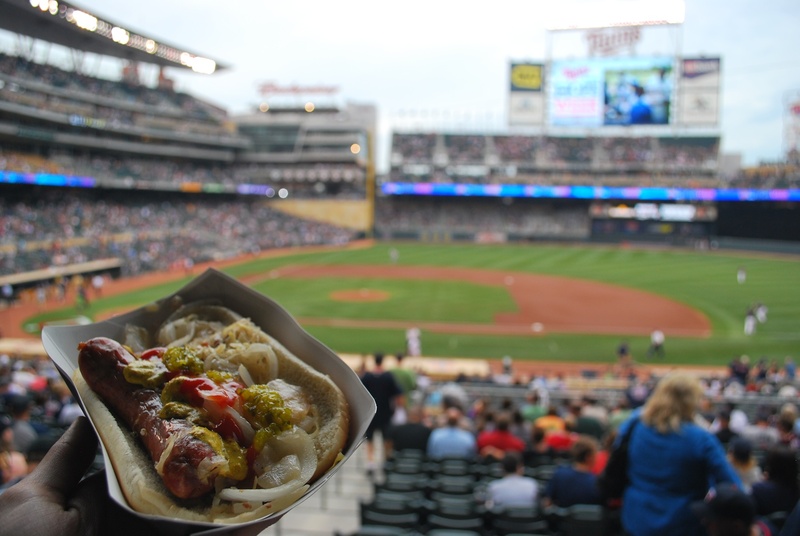 I had been told that Kramarczuks had a good polish sausage so I hit up one of the stands before heading to my seat. It looks amazing but I was underwhelmed. The casing was too hard, which causes you to use more force when taking a bite, which in turn causes all the contents to fall out of the bun. On top of that it was lacking in the flavor department, in my opinion. Today I’ll try the fried walleye on a stick, since I won’t be able to get that anywhere else this season. The game moved along quickly through the first four innings, and remained scoreless. The Twins starter, Francisco Liriano, was dealing, and he had a no hitter through five innings. Here’s a an example of how things were going. Going clockwise from top left. 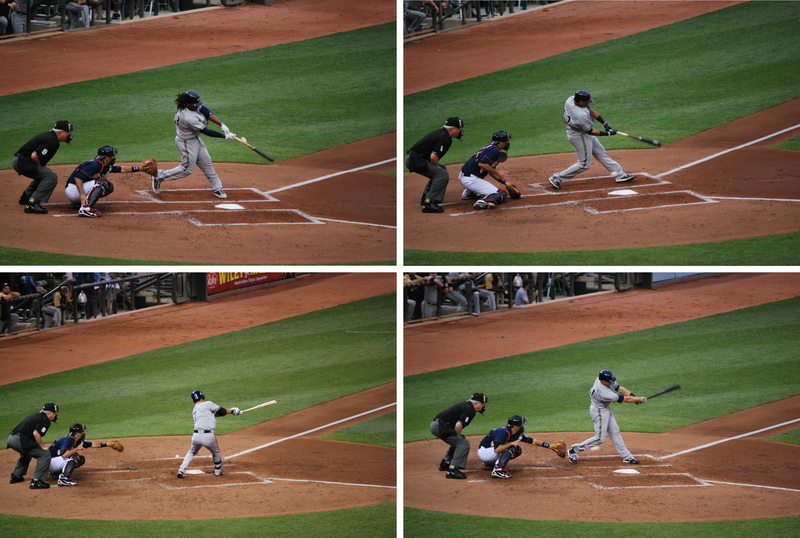 1) Rickie Weeks in the 2nd just barely getting a piece of a ball, but hitting it way down on the handle. 2) Maldonado swinging and missing at an ankle-high ball in the 2nd inning. 4) Norichi Aoki barely fouling off a pitch. Rickie wound up walking in his at bat in the second inning, and stole second base. 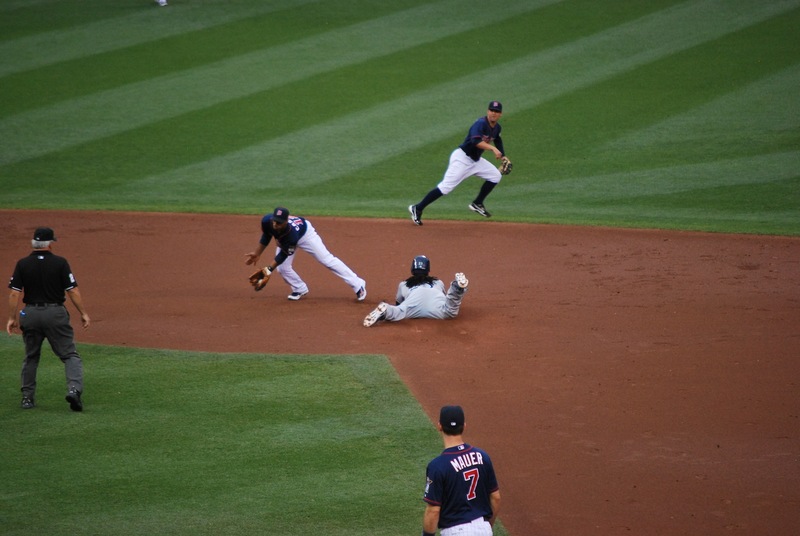 I got a picture of him sliding in safely as Twins second basemen Alexi Casilla snags the one-hop throw from the catcher. 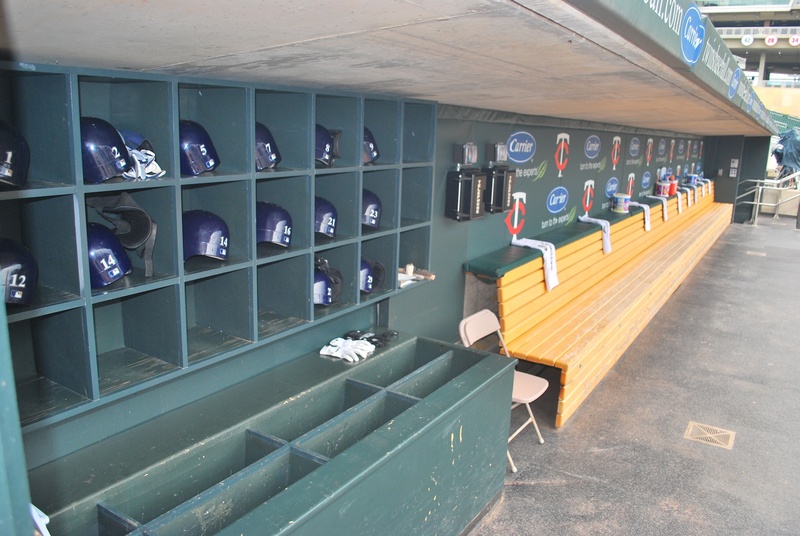 The Twins broke the 0-0 tie with a leadoff home run in the fifth, and then hit three straight singles to score another run. Gallardo loaded the bases with two outs, but then got out of it with no further damage. For that he gets a picture in the blog. I think Aramis Ramirez is enjoying himself a little too much. 1) Braun rounding third as the third base umpire Tony Randazzo looks on. 2) Ed Sedar and Braun going low for a high five. 3) Braun being congratulated at home by Edwin Maysonet and Carlos Gomez, who had drawn the walks before Braun’s homer. 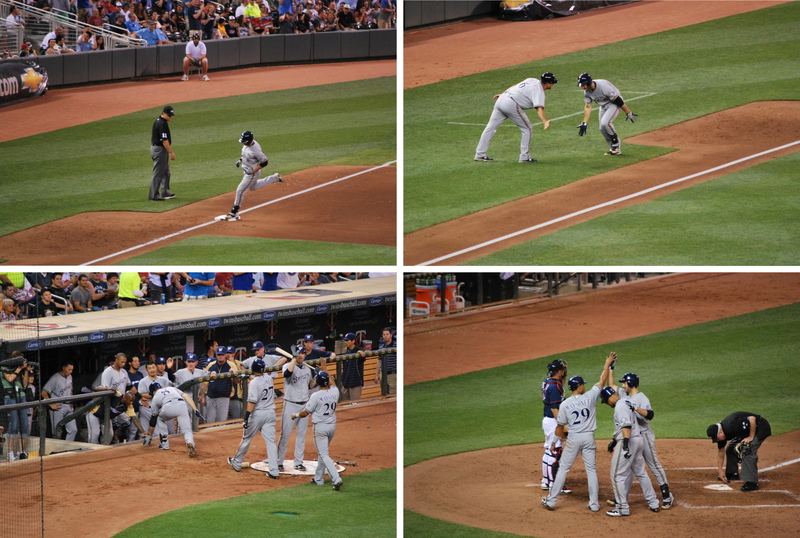 4) Nyjer Morgan giving Braun an extremely low target for a high five as he enters the dugout. The Brewers took a 3-2 lead on Braun’s home run, but the Twins got it right back with another solo home run from Trevor Plouffe. 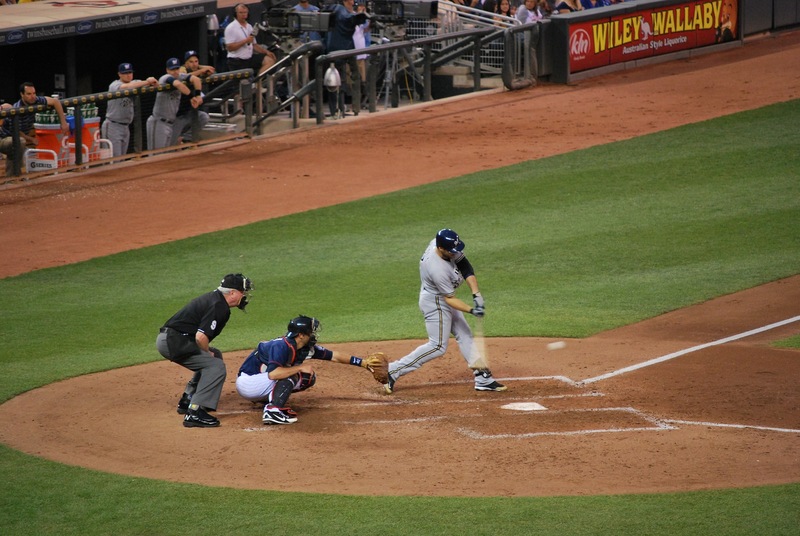 It remained a 3-3 game into the ninth when Corey Hart led off with a ground rule double down the right field line. I thought the lead-off double was going to be wasted after a Rickie Weeks pop-out and a Taylor Green strikeout. 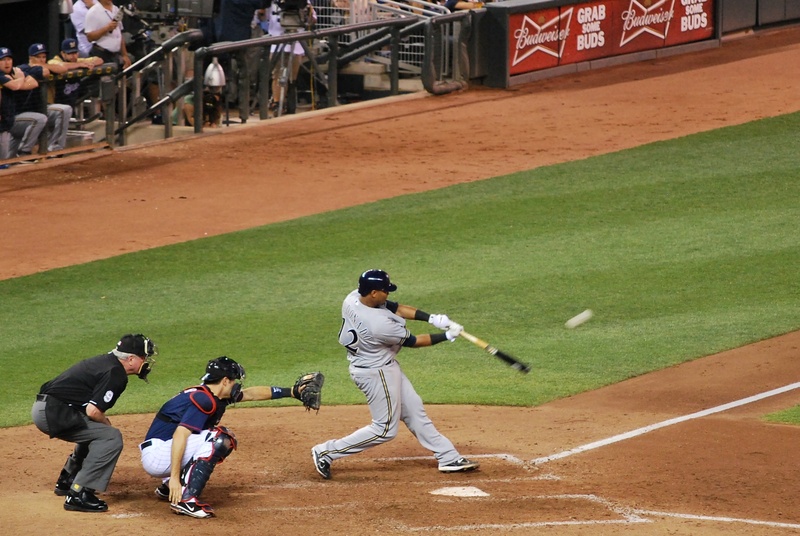 Maldonado delivered once again, however, and on a 2-2 offering from the Twins closer he sent one into the Brewers bullpen to give the Crew a 5-3 lead. 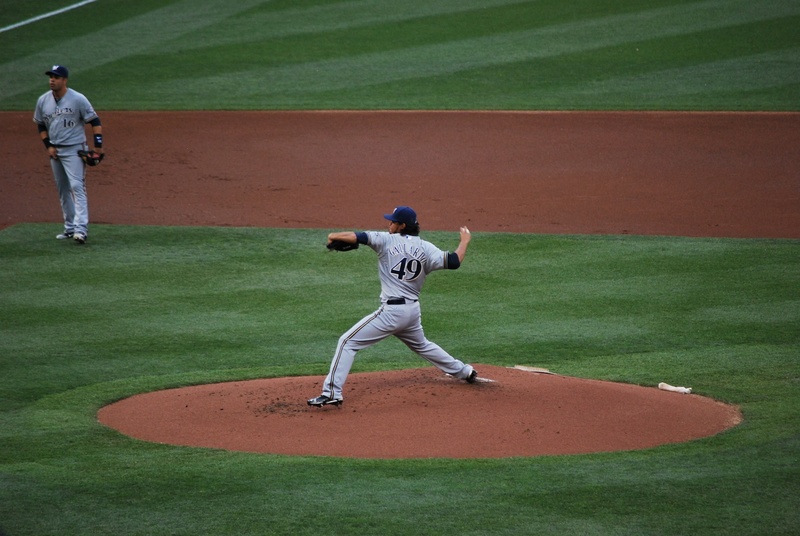 Axford came on in the ninth and tried again to notch his 11th save of the season. 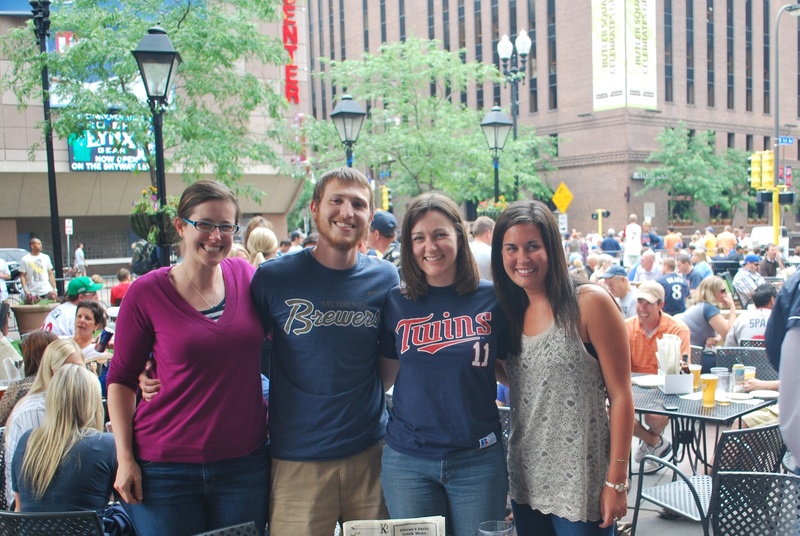 The Twins went down 1-2-3 and the Brewers snapped their three game losing streak. 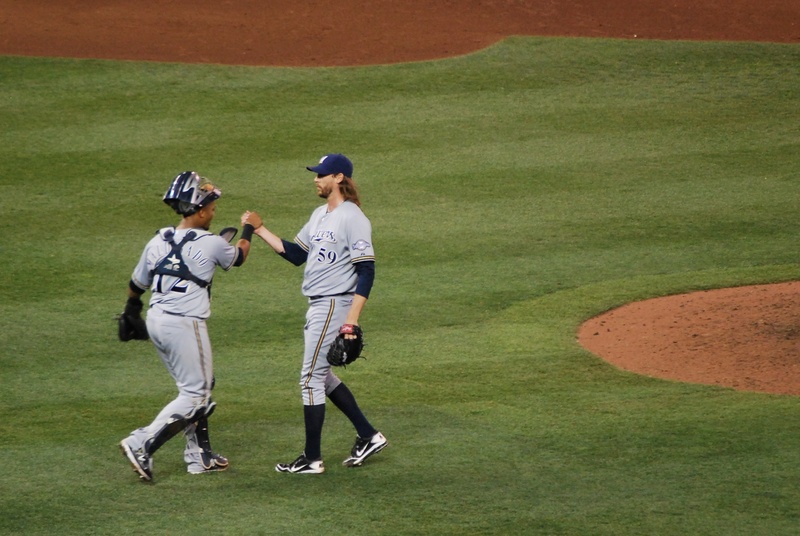 Here’s Axford and Maldonado embracing after the win. It’s raining a bit as I’m writing this, but it’s supposed to clear up and give the teams a window to play in this afternoon. I’m leaving in about 30 minutes, so I need to get a move on.